About three weeks ago, I decided that I should really kick my caffeine habit. 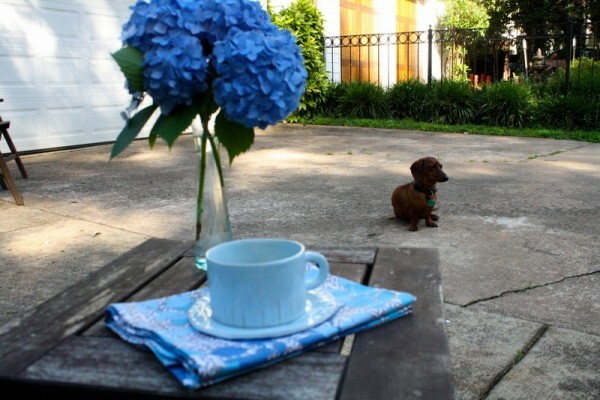 Coffee was making me feel kind of yucky after my second cup, and I every time I drank a diet soda, I felt a bit guilty. Now, don’t get my wrong, I wasn’t downing Diet Dr. Peppers at the rate I did in my early 20’s, but I knew I wasn’t doing myself any favors with the one or two diet sodas I was drinking most days. So I decided that the best way to get rid of my “need” for caffeine was to find a good substitute. The logical alternative drink was tea. So I started drinking tea in the morning. My favorite was and continues to be decaffeinated green tea with mint. I also make up for the lack of sodas with sparkling water and iced tea. Iced tea has become my go-to cold drink. I grew up drinking super sweet iced tea, which was SO not healthy. But I’ve come to love cold tea once again by making it in a healthier way. 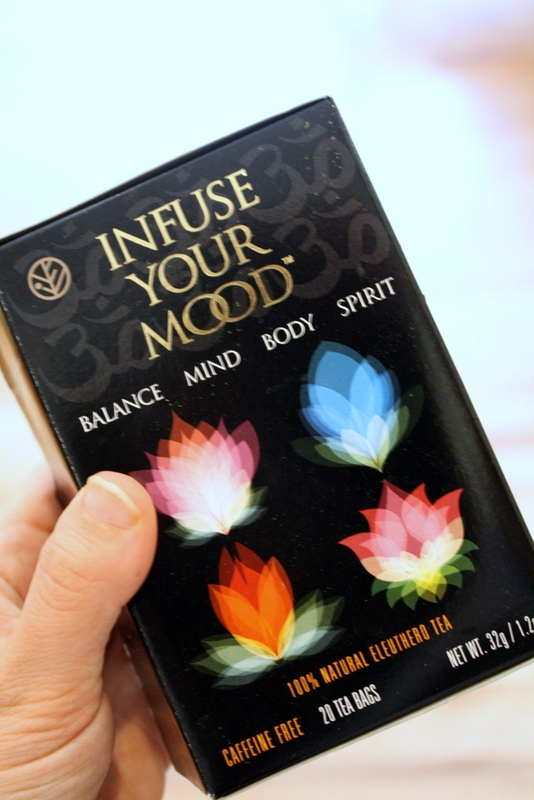 A few weeks before I started on my journey to kick my caffeine habit, I was sent Infuse Your Mood tea to try. I was intrigued. Could a tea really improve my mood? For thousands of years, traditional Eastern cultures have used Eleuthero as a natural pathway to relaxing and communing with the very center of physical and emotional life. Enjoying Infuse Your Mood Eleuthero Tea can help take you to a natural, almost spiritual place of soothing comfort often lacking in our hectic modern lifestyles. I’ve been drinking the tea for a little over a week and I’m not sure if my mood has improved. I’m generally in a good mood, but wonder if I could pinpoint the time of day when I feel the most “blah” — the mid-afternoon. To me, the tea tastes a lot like orange pekoe tea, which is the typical tea used to make conventional iced tea. The way I like to make it best is an “iced” version. 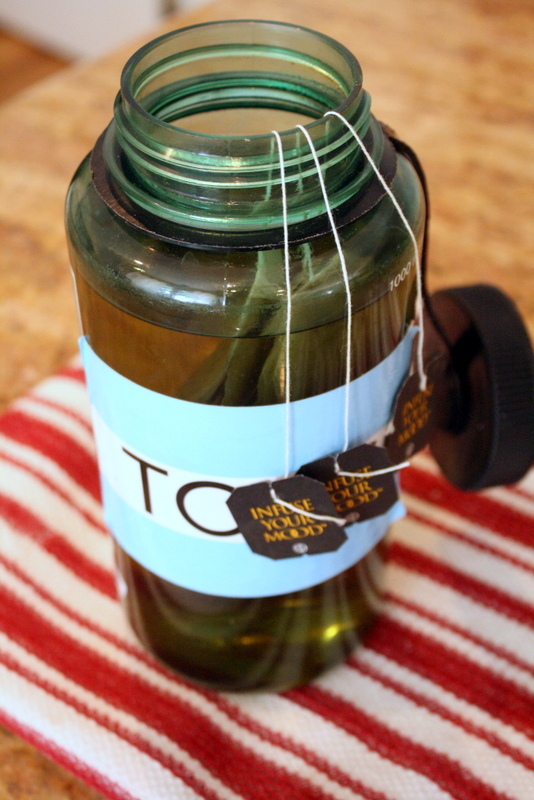 I bring a teapot of water to a boil, then pour it into a large Nalgene botttle (proudly displaying a Tom’s sticker), with three Infuse Your Mood tea bags. I let it steep for at least 15 minutes because I like strong tea. It puts hair on my chest. haha. Then I stick the piping hot water in the freezer for about an hour to cool it down. When I remove it, I add some NuNaturals liquid Stevia and enjoy it throughout my morning, switching to water in the afternoon. I like the tea and really enjoy it cold this way. Right now, a box of 20 teabags is on sale for $7.61 on the Sun Chlollera website. I’m considering purchasing another box to do a little science experiment where I test drinking it in the afternoon versus the morning. I’m a big believer in homeopathic remedies so I’m curious if this tea could get me over the 3 pm slump. Have you ever tried Eleuthuro tea or any other mood enhancing homeopathic products?